My mom is an amazing cook. Over the years, she has perfected her versions of classic Indian dishes and has also developed her own twists on traditional recipes. Recently she has started writing up some of her recipes so that my sister and I can learn them. I'm very excited to share one of these recipes today! Dal refers to any number of Indian dishes featuring lentils. I think of dal as comfort food, sort of like the Indian version of chicken soup. This version uses moong dal (split green lentils aka mung beans) and Swiss chard, spiced with ginger, cumin, coriander, and garam masala. You can definitely play with different lentils or greens - my mom recommends using masoor dal (red lentils) or black-eyed peas, and spinach. 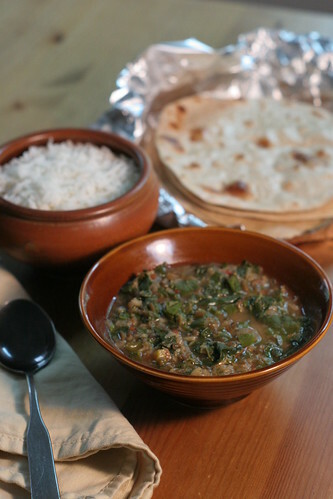 This dal makes a great healthy vegetarian meal, paired with whole wheat flatbreads (chapatis) or rice. p.s. You may have noticed that I'm revamping the site a bit. I've moved the favorite cookbooks list to a tab at the top of the page, and I'm working on adding descriptions of the cookbooks. I've also added a tab with links to the absolute best recipes that I've posted. Finally, I've added a "Fitness" tab, which is still a work in progress. I'm trying to make exercise a bigger part of my life, so I'll talk a bit about how I'm doing that. Feedback on any of this will be appreciated! Ingredients like moong dal and garam masala will be easily found in an Indian grocery store, and might be available in a well-stocked supermarket. They can probably also be ordered online. Bring a large pot of water to a boil. Add chard leaves and cook for 5 minutes. Drain immediately and run under cold water until cool enough to handle. Squeeze out excess water and chop the chard leaves. Meanwhile, cover lentils with 3 cups of water in a 2-quart saucepan. Bring to a boil and cook lentils until they are tender and just beginning to fall apart, skimming off any foam, about 20 minutes. Remove from heat but do not drain. In a 3 quart saucepan, heat a splash of oil (1-2 tbs) over medium heat. When oil is hot, add cumin seeds and roast for 30 to 45 seconds, stirring frequently. Add the onions, ginger, and green chiles and cook until the onion is softened and beginning to brown, about 5 minutes. Add the chopped tomatoes and cook for about 1 minute. Add the coriander powder, garam masala, and a 1/2 cup of water and cook until the tomatoes break down, about 5 minutes. Add the lentils along with the cooking water. Add 2 cups of water, bring to a boil, then lower to a simmer. 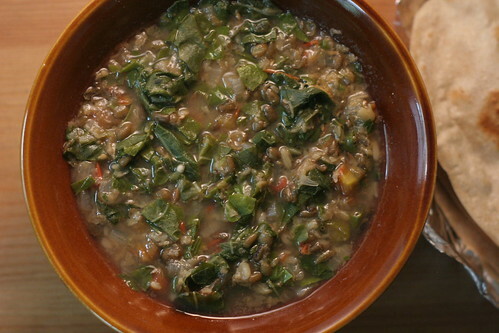 Add the chopped Swiss chard and cook the dal for five minutes to allow the flavors to blend. 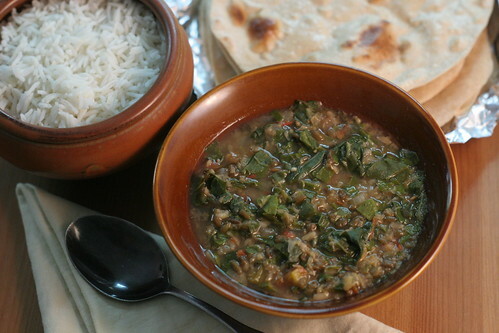 Serve dal with flatbreads such as chapatis, or rice. Dal can be stored for a few days in the refrigerator - it may thicken as it is stored, so you may need to add a little water to loosen it up before reheating. I'm a huge fan of dal, but I never seem to get it quite right. This looks so tasty. Will have to try this recipe soon! Hi Jen - thanks for visiting! Let me know what you think if you try the recipe! You are so lucky to get these great dishes first hand, Indian is one of my favorite cuisines!